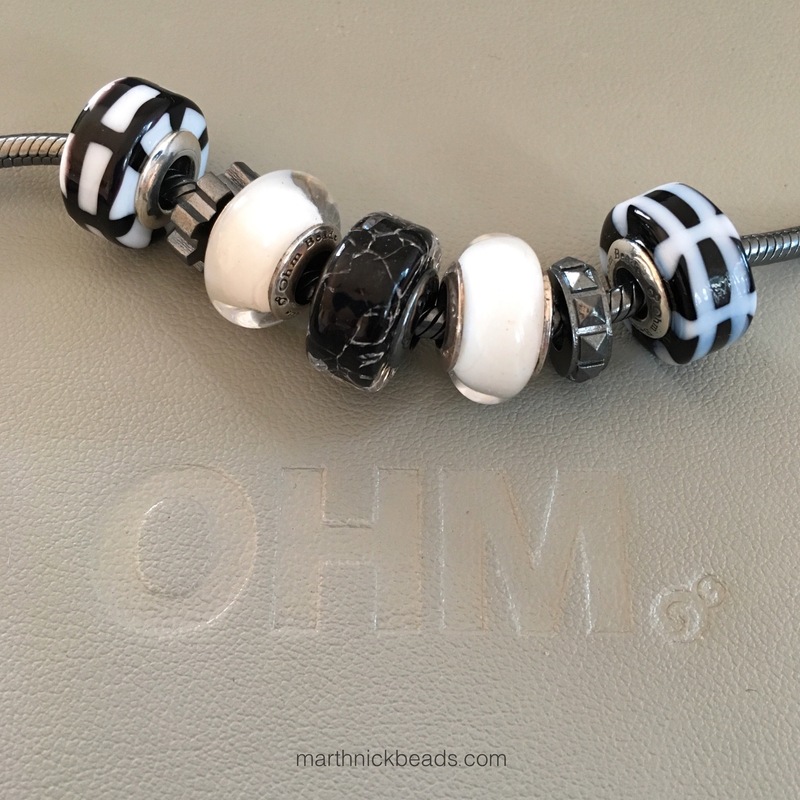 Today I’ve got some pictures of two new Ohm Beads called As Above and So Below. They are available individually but work nicely as a pair. First up is a bangle with the red Tartan Gore in the middle. So Below is the black stripes on white on the left and As Above is the white stripes on the black on the right. I don’t see how I’m possibly going to remember that. 😀The spacers are Mech Tech, left and Hot Topic, right. I really like the Ohm play tray (in these photos) that was in the goodie bags at the Bead Bash! Makes a nice change from my usual wooden table backdrop and it’s an awesome place for keeping bracelets that I’m going to wear the next day. Sometimes quite a mess gathers on it as I also use it to transport beads outside for photos and then go for a few days before putting everything back away. I think I can safely assume I’m not the only one with the occasional bead mess! With the black and white theme the new Dark Soul and old Cold Milk beads go really well with the As Above and So Below beads. Here is a larger bracelet, keeping a red/black/white theme. I thought this could be a good Monday bracelet with Grumpy Cat and Moon Me, ha! Left to right below are Metal-ness, Moon Me, Widget, Salamander Schnozberry, Dark Soul, Jiangshi, As Above and Mech Tech. Left to right below after Mech Tech are Broken Heart, Hot Topic, So Below, Ohm? Terrible., and Dalmatian Dactylogram. Left to right below after the Dalmatian Dactylogram are Tartan Gore, Cranium, L’il Devil and Metal-ness. The red looks so good with the black and white. I especially like the Tartan Gore because it’s similar in pattern. And then there’s that Cold Milk! 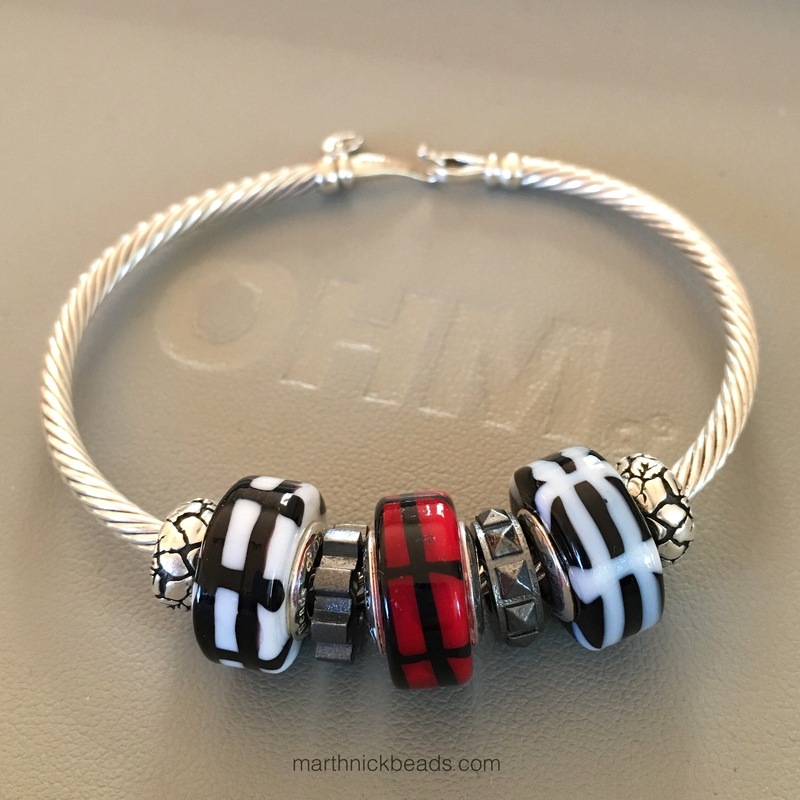 Mike at Ohm was the one who suggested the Tartan Gore would look good with these new beads! Yeah, I love the plain white Cold Milks with the patterned black and white beads. So versatile! 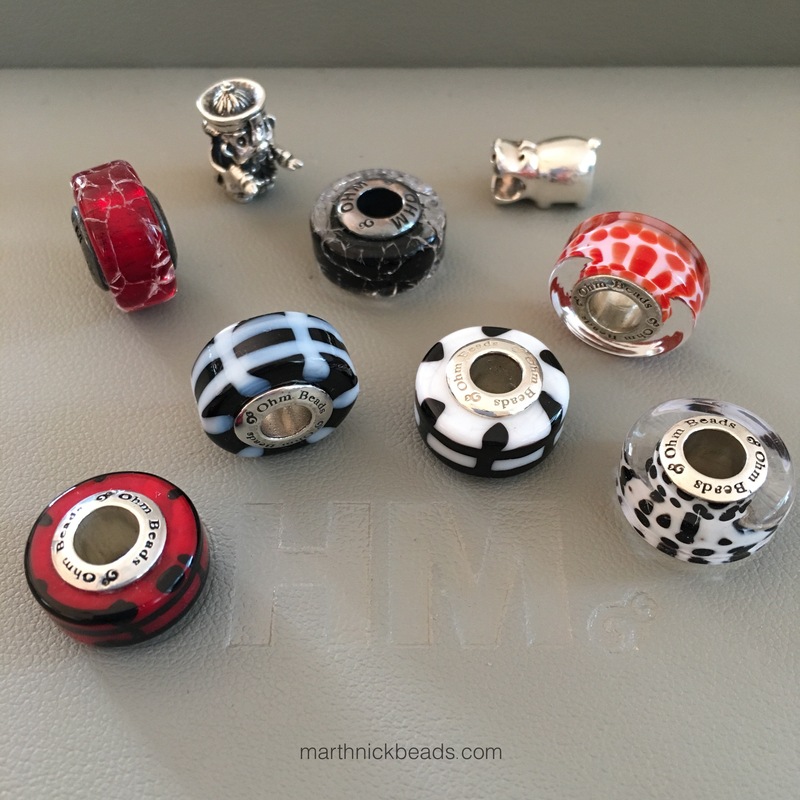 These are such handsome beads! My daughter has been a Steampunk sort of gal for some time and she thinks it’s high time a company did some SP themed beads, as do I. Trust Ohm to do that! 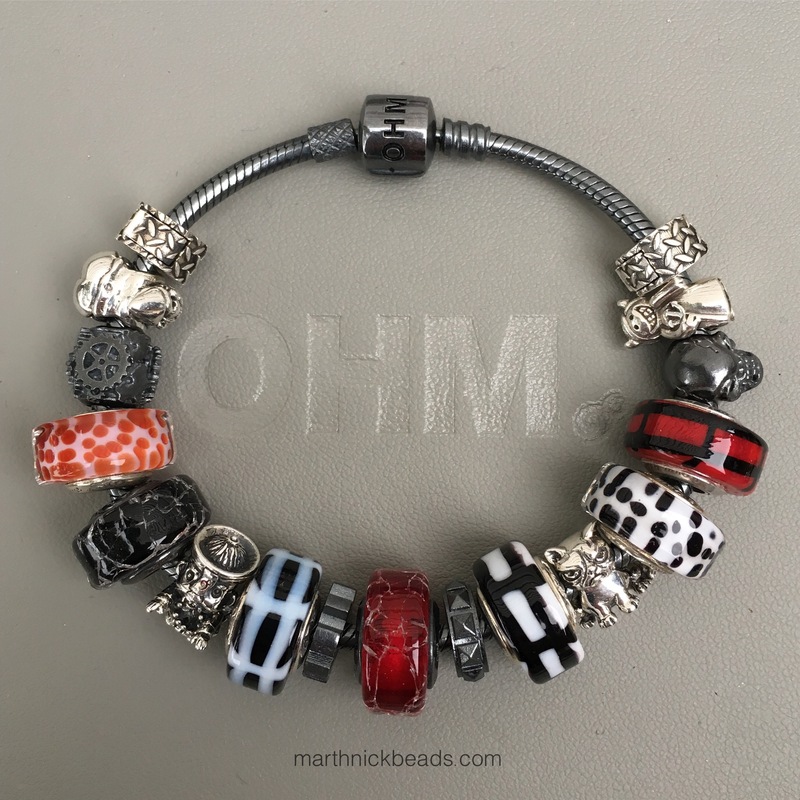 These beads all look great together and I so wish I had endless pots of money so I could have a full Ohm bracelet! You make everything look great when you style and photograph your amazing collection. Best Bead Blog there is, truly! You’re too kind, Sarah, thank you. Some of these beads would be perfect for your daughter, indeed! I will show her when I go home, but I actually like those spacers very much!